For laser vision correction in St. Louis, use STL Vision. Dr. Schell performs LASIK utilizing the femtosecond laser and has a 95% satisfaction rate. Laser Vision Correction (LVC) is a broad term that applies to an elective outpatient surgical procedure that is chosen to modify or eliminate refractive error (nearsightedness, farsightedness, and astigmatism). The two most common options are LASIK and PRK. Both work by using a laser to reshape the cornea and change the focusing power of the eye, thus decreasing or even eliminating the need for glasses or contacts. LASIK was patented more than 20 years ago and has been FDA approved since 1999. Since then, more than 28 million patients around the world have chosen LASIK to help correct their refractive error. According to a report from the American Society of Cataract and Refractive Surgeons published in 2008, LASIK has a stellar track record with a more than 95% satisfaction rate. 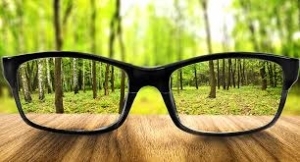 Other studies have shown that greater than 90% of patients will achieve at least 20/40 or better vision without the need for glasses or contacts. This is the level of vision required to drive legally. Of course, many patients achieve 20/20 vision or even better. Dr. Schell is an American Board of Ophthalmology certified and Cornea and External Disease fellowship trained refractive surgeon. He performs LASIK utilizing the IntraLaseTM femtosecond laser which allows him to make a thin LASIK flap (around 1/10th of 1 mm) and avoid the need for a blade. The cornea is then remodeled using a customized profile unique to the patient’s eye with the VISX Star S4TM eximer laser. In a short time, the patient is heading back home and the healing process has begun. PRK predates LASIK and was FDA approved in the mid-1990’s. The biggest difference between PRK and LASIK is that PRK does not involve the creation of a small flap in the cornea. Rather, the outermost layer of the cornea (epithelium) is gently removed prior to remodeling the cornea with the laser. At the end of the procedure a soft contact lens is placed on the surface of the eye to help with healing and control discomfort. This contact is left in place for approximately 1 week and then is removed once the corneal epithelium is fully healed. PRK may be a good alternative to LASIK in patients who have been told their corneas are too thin for LASIK or in patients who are uncomfortable with the idea of a LASIK flap. PRK is associated with more discomfort than LASIK and a longer recovery period, but recent studies have confirmed that the final vision that is achieved with PRK is equal to that of LASIK. LASIK and PRK are elective surgical procedures and are not for everyone. Additional patient information is available online through the American Academy of Ophthalmology, or by coming into our office and requesting our LVC overview. Call or contact us online to learn more about the screening process, up to date prices, and financing options. At the time of your consultation with Dr. Schell, he will fully discuss the risks, benefits, and alternatives to laser vision correction so that you can decide what option is best for you and your visual needs.